The aims of the Crosby and District Historical Society are to promote the advancement of the education of the community by developing public interest in all aspects of local history of the district of Crosby and surrounding areas. The Society was founded in 1945 and meets on the fourth Monday of each month from September to May, except for December (first Monday). Meetings are held in the Methodist Church Hall in Moor Lane starting at 7.30 and the annual subscription is £16. The talks include a wide variety of aspects of local history and cover not just Crosby but the surrounding districts of the Borough of Sefton, Liverpool, Lancashire and the Wirral. Visits to places of historical interest feature a half day outing, a longer all day coach outing and an annual dinner held locally with a tour of the building and appropriate speaker. 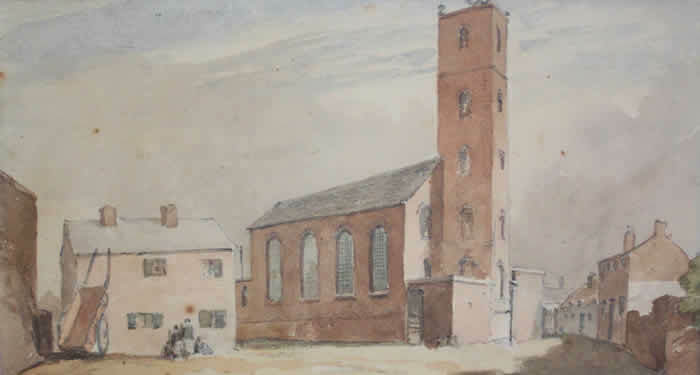 St Michael's Chapel which preceded St Luke's Church in Crosby from a watercolour dated 1854 by WG Herdman. Reproduced by kind permission of the Liverpool City Librarian. Photo by Graham Hignett, Alexander PR & Communications, Crosby.